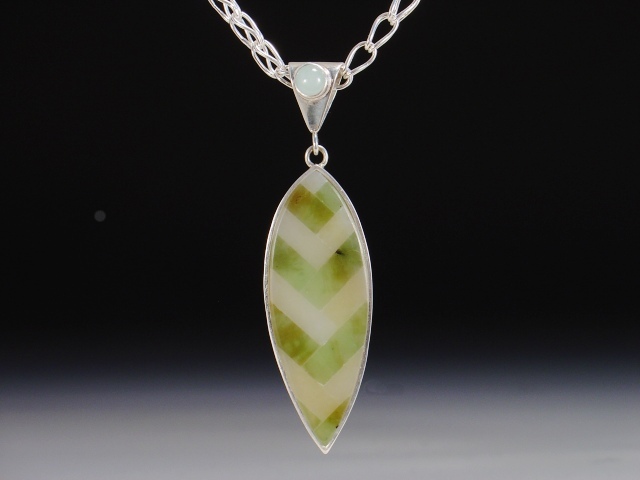 For this necklace I chose two complementory jades and inlayed a zig zag leaf pattern. They are a white Siberian Nephrite jade, which is creamy white color, and Russian "Spinach" jade, which is a light to medium green. Both jades have a sublte and natural color variation. The pandant is sterling silver and topped with a natural aquamarine. The 18" chain is a handmade fine silver loop in loop design.